This is our review of Natural Care Ultra VeinGuard Capsules. It is a homeopathic formula that uses highly diluted substances to give you vein health and support. It it meant to relieve symptoms of varicose veins, aching legs and feet, spider veins, and tired, heavy and restless legs. Continue reading for our full review. Other Ingredients: Ascorbic acid, bromelain, butcher’s broom, capsule (gelatin, glycerin, and titanium dioxide), cayenne, ginger root, gotu kola, grape seed, horse chestnut seed, magnesium amino acid chelate, quercetin, and rutin. 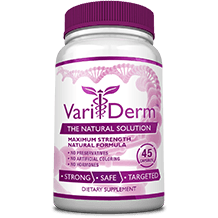 These ingredients work by strengthening and toning blood vessels, relieving inflammation, inhibiting vein swelling and enabling them to function properly. It is recommended to take 1 capsule, 3 times daily with meals. For optimal benefits, take 2 capsules 3 times a day. There were no side effects listed on the manufacturers website. You should speak to a doctor before taking this product if you are pregnant or nursing. In case of overdose, get medical attention or contact a Poison Control center immediately. 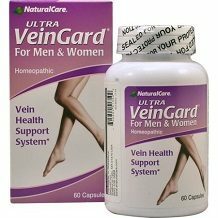 NaturalCare Ultra VeinGuard Capsules is sold for $18.89 on the manufacturers website. This product will last you about 10-20 days. We were able to find it for less on other seller’s websites. $13.44 was the lowest selling price we were able to find. This product has a 100% satisfaction guarantee. You can return the product for whatever reason within 90 days of purchase for a full refund not including shipping and handling. Damaged items may only be eligible for partial refund or merchandise credit. The customer reviews for this product were mixed. Many felt that this supplement helped while other saw no results. There are a couple of positive things about NaturalCare Ultra VeinGuard Capsules. It has a pretty fair guarantee which allows you to try the product and still be qualified for a refund if the product had no effect. It also has many positive customer reviews. Customers were happy with the pain relief they received from taking this product and the support it gave to their circulation. There are a few things that concern us as well. This product is a bit on the expensive side. It will only last 10-20 days and we are not sure if that’s even enough time to see results, which means you will have to purchase another bottle to give it a fair chance. We also read a bunch of customer reviews saying that customers have tried more effective products in the past or the product was just not effective. We feel that there are better options out there and would not recommend this product.